Signaling with light goes back to ancient times when militaries and towns communicated with simple encryption methods. Paul Revere relied on lamp light signals (i.e., one if by land, two if by sea). Sailors use(d) signal lamps relay simple messages. Even the Warning Beacons of Gondor were a form of light beam communications (albeit 1 bit -- lit or not lit). To date, the farthest distance over which reliable (at useful data rates) terrestrial communications has been accomplished on a light beam is about 2 miles (3 km). Atmospheric contamination and Earth curvature (line-of-sight with a tiny bit of refraction assistance) are the primary limiting factors. By contrast, millions of miles have separated successful space communications, but the baud rates are typically measured in the hundreds or thousands of bytes per second. 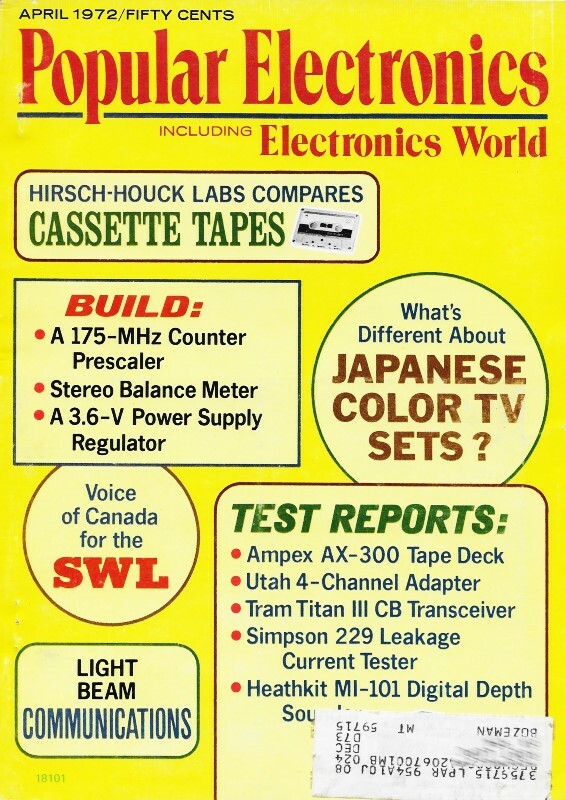 This 1972 article from Popular Electronics magazine reports on experiments being carried out with lasers. Their terabit data rate predictions are being realized today. See also Twisted Light Beams a Greeting over Record Distance of 143 km. The idea of using a light beam to send messages from one place to another is far from new. In fact, it is probably as old as civilization itself. Since its inception, the basic method of communicating by this medium has been to interrupt the light beam according to a prearranged code system. The principle has not changed much since the first man realized that a light beam could be used to communicate over distances too long for his voice to carry. 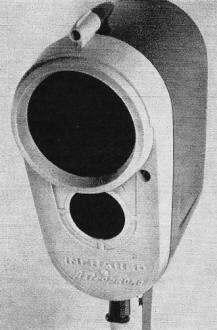 A laser diode (in the upper unit) voice communicator developed by Holobeam, Inc. for ship-to-ship speech. 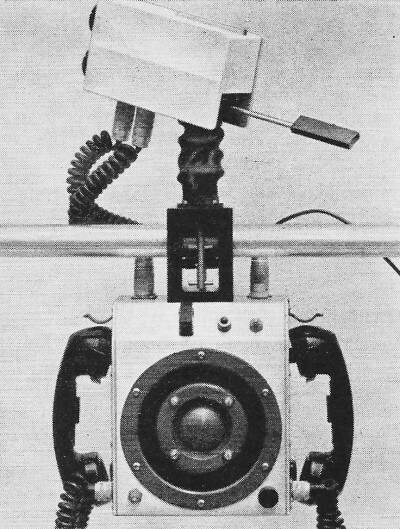 Beginning in the 19th century and coming right up to the late 1950's, sporadic attempts were made to perfect light-beam communication equipment that would carry voice messages or high-speed codes over moderately long distances. But, even after pouring all their efforts into the project, scientists failed to perfect light-beam communication. Their designs in this century, when compared with existing radio communication systems, suffered from severely limited operating ranges, low information handling capacities, poor fidelity, and interference from bright ambient light. Little wonder, then, that some of the sincerest of scientific efforts at designing a practical light-beam communicator ended up as toys, construction projects in magazines, science fair projects, and just plain curiosities. One popular white-light communicator which resulted from scientific efforts employed a microphone or telegraph key to operate a small loudspeaker fitted with a silvered diaphragm. Electrical signals fed through the amplifier made the diaphragm vibrate. A beam of white light focused on the diaphragm reflected out of the transmitter, carrying along the vibration as changes in light intensity. In another simple arrangement, the key merely turned on and off a light bulb, or the output of a microphone amplifier controlled the brightness of the light. At the receiver end of the communication link, a sensitive photodetector picked up the light beam and translated the light intensity fluctuations into voltage changes. The voltage from the photodetector then drove an amplifier/speaker (or earphone) arrangement, reproducing the vibrations introduced at the transmitter by the sender of the message. Short operating ranges and poor fidelity notwithstanding, these simple light-beam communicators gave experimenters their first inexpensive walkie-talkies. However, when the Citizens Band came into vogue, light-beam communication was driven into a limbo which lasted until 1969 - the year light-emitting diodes finally became available at low cost. LED Communicators. Light-emitting diodes, or LED's, are semiconductor diodes which emit relatively pure infrared light when a current is passed through them. Light from an ordinary incandescent lamp contains just about every color in the spectrum. Light energy from an LED, on the other hand, is concentrated in a very narrow band of the light spectrum, making it possible to select a photo detector that re­sponds only to that band. With the photodetector carefully matched to the LED emissions, ambient light has very little effect upon the communication link. Without interference from other light sources, it becomes possible to attain communication ranges of several miles even in broad daylight. A helium-neon gas laser (upper left) provides beam for experimental optical communications setup at Bell Labs. The new LED communication schemes are working out so well that several companies now produce them for industrial and commercial use. Laser Diode Communicators. While LED's generate a narrow spectrum of infrared light, compared to high-quality laser light, their light is highly contaminated with a number of different phases and wavelengths. Because the intensity of an LED light beam falls off with the square of the distance it travels, telescopic attachments can compensate for some of the losses. But there is a point where the scheme becomes impractical. So, future application of LED communicators will probably be restricted to low-cost portable voice communicators and short-range links. The real future of light-beam communication rests with laser light which is so bright initially that it retains much of its original intensity over longer transmission distances. Just as relatively pure LED light gives light-emitting diode communicators greater range than comparable white-light systems, the coherent nature of laser light multiplies the operating range beyond that feasible with LED's. Optical communication researchers are now working with three different kinds of laser sources: laser diodes, solid-state lasers, and gas lasers. Of the laser communication systems presently under development, those using laser diodes show the greatest promise for immediate applications. Laser diodes, properly called injection lasers, operate on the same general principle as LED's. The former, however, are capable of producing much greater output power in addition to generating true coherent laser light. Unfortunately, the tendency for laser diode devices to overheat has still to be overcome. Typically, 10 amperes of current must be pumped through the laser diode to generate one or more useful watts of laser light. Commercially available laser diodes are incapable of withstanding such high currents over long periods of time without overheating. Hence, most laser diode communicators presently in use are operated in pulse mode. Using bigger circuits similar to those used in strobe lighting systems, a laser diode transmitter fires its diode with large doses of current for about 0.1 μs at a time. By permitting the diode to cool for about 100 μs between firings, a pulse operating frequency of about 10,000 Hz can be achieved. Simple light-beam communicator such as this one made by Infrared Industries, Inc. used infrared filters over white light source to make the beam invisible and reduce stray light. Hughes Aircraft's Santa Barbara Research Center is marketing a portable laser diode voice communicator that uses pulse triggering. It produces 2 watts of peak power, sufficient to establish a communication link over a distance of 6 miles in good weather. This basic equipment range can be considerably extended by adding elaborate telescopic attachments. The trigger pulses for the laser diode are frequency modulated. With a carrier frequency of 6000 Hz, the system can carry a single channel of voice information with frequencies up to 2300 Hz. Although current pulses through the laser diode may reach 40 amperes, the transmitter circuit drains only about 10 mA average current from a 12-volt battery pack. 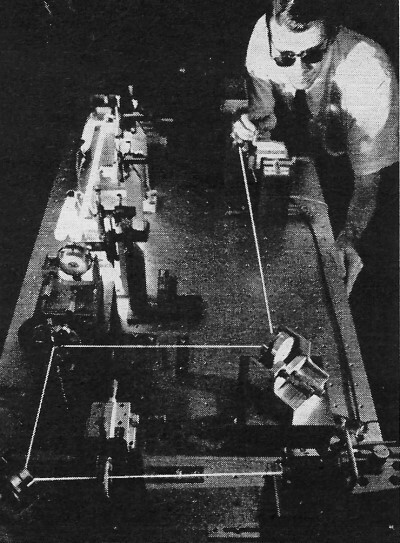 Another portable laser diode communicator, built by Holobeam for the Navy, also uses short-pulse firing. The carrier is pulse-position modulated; so, voice information fed into the transmitter varies the position of each pulse with respect to some standard "no-signal" position. Conservative military specifications list the maximum operating range at 1.5 miles, but the transmitter's 8-watt peak output power could easily multiply this figure. Several major companies, among them Bell Laboratories and Texas Instruments, have under development more efficient laser diodes which are not restricted to the pulse mode. Such diodes promise to combine the high-frequency and continuous-wave characteristics of LED's with the high power and coherent light of modern laser diodes. YAG Communicators. Bell Labs is working on a portable laser communicator which uses an yttrium-aluminum-garnet (YAG) solid-state laser source. Closely related to the artificial ruby, the YAG laser has served laser technology almost from the beginning. Unlike laser diodes, YAG lasers are light amplifiers which convert a flash of light energy into a more powerful beam of laser light. The problem is to find a way to fire the light that excites the YAG crystal. Researchers at Bell Labs believe that laser diodes make a suitable source of stimulation for a YAG laser. By firing the YAG crystal with a laser diode flash, they hope to produce a medium-power YAG communicator as portable as laser diode communicators. The YAG devices will operate in a fast pulse mode as do laser diodes, but the former will generate much more high-quality laser light. Gas laser Communication links. All the light-beam communication work using LED's, laser diodes, and YAG lasers is aimed at providing portable short-range communicators capable of carrying only a few channels of information at a time. But the time is coming when the laser links will have to take over where the already overcrowded radio, TV, and telephone channels leave off. A single laser beam will then have to carry millions of bits of information every second from point to point. Most researchers developing long-range, high-capacity laser links agree that gas lasers are the most suitable sources of light for their purposes. Gas lasers use a mixture of at least two gases. In a helium-neon (He-Ne) laser, for example, passing a current through the tube makes the neon produce ultraviolet radiation which stimulates laser emission from the helium. As long as current flows, the gases continue to do their work. 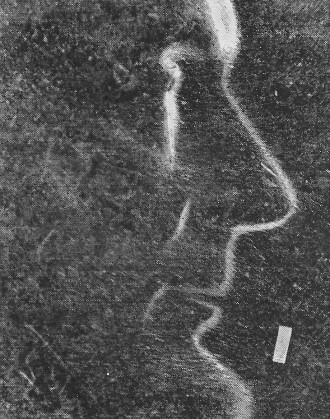 Laser diode chip from Bell Labs (on a penny) can operate continuously at room temperature and is for possible use in small, low-cost communicators. It is possible to impress information onto a gas laser beam by varying the amount of current through the tube. A far more effective modulation technique uses special external filters which change their planes of polarization in only one direction. Rotating a polarized filter in the beam path changes the amount of light (intensity) passing through. The special voltage-sensitive filters, made of a crystal such as lithium tantalate, rotate the plane of polarization according to an applied signal voltage. A continuous laser beam can be modulated at frequencies in the GHz range - of which no known electronic circuits can take full advantage. The best electronics technology can do today to take advantage of the bandwidth is to use a number of circuits to drive an equal number of polarization filters. By passing a single light beam through all the filters, all the electronic inputs become impressed on it. It is believed that it is possible to construct such a communication link to carry 200,000,000,000,000 bits of information. Such a system could be capable of handling all voice, TV, facsimile, computer, and commercial radio information entering and leaving a city as large as New York. Laser beams travel in straight lines; so, future long-distance communication systems will have to use a series of mirrors or repeaters to make the beam follow the earth's curvature. Another scheme calls for using mirrors on orbiting satellites to reflect the beam from one point to another thousands of miles apart on the earth's surface. An entirely different transmission technique will employ fiber optics to get the beam around. A modified version of this will use evacuated pipes, outfitted with reflectors, to carry the beam. These two methods have the special advantages of being immune to atmospheric disturbances. Gas laser communications is progressing at a rather slow rate compared to the progress being made in LED and laser diode schemes. The reason is that there is presently no real need for communication links which have such staggering information handling capacities. When the time is right, high-performance laser communication systems now operating in experimental labs will be ready to open new communication channels which have virtually no limit with reference to operating range and information-handling capacity.